John, I hope you're able to convince Joel he has much to live for, and how much his struggles so far to overcome his illnesses have inspired others. At the Hallamshire on the head and neck ward,it is an emergency but I’m not panicking yet. Joel’s ok at the minute,I’ll come back to you when I’ve got some info. He’s ok,I’ll come back to you when they’re done poking things in hiis head. All the best for you and your son. You'll probably know that I can understand that family are more important than even the mighty Rams. Cheers,he’s ok and we’re at home. Joel’s neck has swelled up both sides and the concern was another abscess but they’re happy enough to let him home. Going in Monday,first of a couple of weeks of appointments. We’re trying to keep cool,no change in Joel’s health but it’s not got worse. Got this to give him when he goes in Monday...kept it as a surprise to cheer him up. What and why do they have that squigly thing before the name? Never noticed that before. Must be a mistake on that one. It's to do with Mind, the mental health charity. I hope that's not match worn. 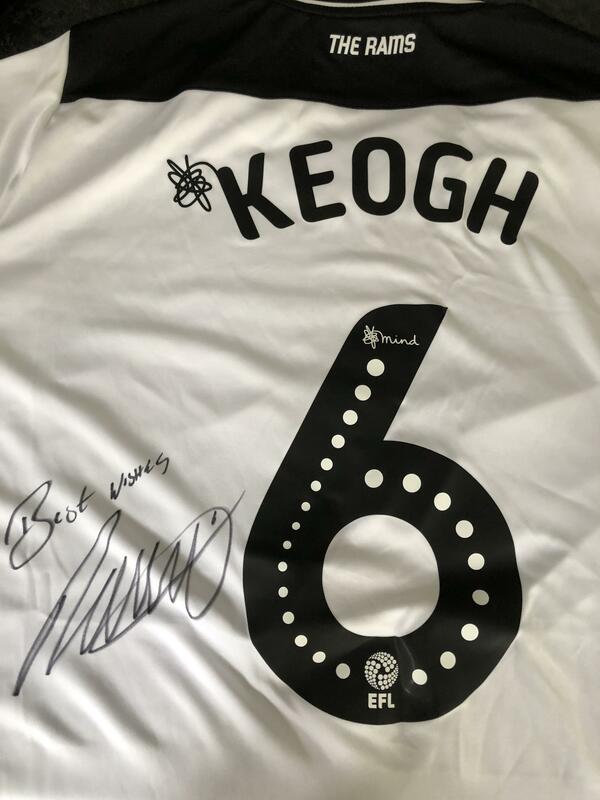 My brother won Keogh's match-worn shirt in an auction and it absolutely reeked. I hope he doesn't smell like that after a shower. I should just add that we never keep anything we’re given(apart from Incey’s boots)and this has already been sold for good causes,when we’ve finished with this years treatment,whatever tgat entails.